The hashtags #TakeAKnee and #VeteransForKaepernick began trending Sunday. Since former San Francisco 49ers quarterback Colin Kaepernick began kneeling during the national anthem in the 2016 pre-season, several veterans who fought for the U.S. military have been expressing their support for Kaepernick's protest. President Donald Trump may have helped turn Kaepernick's silent demonstration into a bonafide movement when he suggested that NFL owners fire players who protest the national anthem during a Friday rally in Huntsville, Alabama. "Wouldn’t you love to see one of the NFL owners, when somebody disrespects our flag, to say 'Get that son of a b---- off the field right now?'" Trump said. On Twitter, Trump defended his comments, saying that "Courageous Patriots have fought and died for our great American Flag." Trump retweeted a photo of Pat Tillman, the former NFL player turned Army Ranger who died in Afghanistan in 2004 after enlisting in the aftermath of the 9/11 terror attacks. Trump's comments spurred a backlash that included protest against the "Star Spangled Banner" across several NFL teams on Sunday. Several veterans who fought in the U.S. armed forces echoed the players' sentiments. A photo of 97-year-old World War II veteran John Middlemas taking a knee went viral, after the man's grandson Brendan Gilmore posted it to Twitter. The tweet -- which included a photo of the farmer from Willard, Missouri, kneeling on the ground accompanied by what Gilmore said was his grandfather's phrase "those kids have every right to protest" -- was retweeted nearly 130,000 times in just a day. Gilmore wrote that his grandfather "has been an ally to the civil rights movement for many years." The hashtag #VeteransForKaepernick began trending after people took notice that the former quarterback, who currently isn't signed to a NFL team, was not standing for the national anthem. After Sunday's gameday protests, veterans took to Twitter again using the hashtag along with a new one, #TakeAKnee. We don't join to serve/honor a flag or song. To anyone saying #TakeAKnee is disrespectful to veterans I have something to say. You don't care about Veterans! Some NFL players decided to stand for the anthem on Sunday. 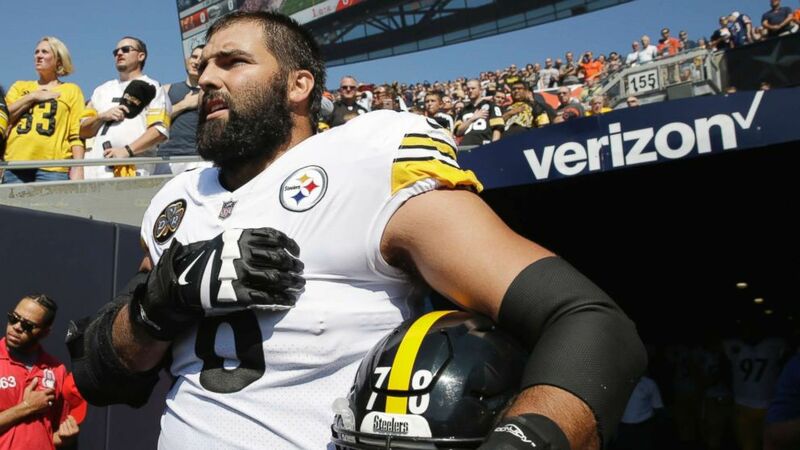 Pittsburgh Steelers left tackle Alejandro Villanueva -- a former Army Ranger -- took to the field and placed his hand on his heart during the "Star Spangled Banner," despite his team's decision to skip the national anthem altogether. However, in the past, Villanueva has expressed solidarity with Kaepernick, saying in a 2016 interview, "I will be the first one to hold hands with Colin Kaepernick and do something about the way minorities are being treated in the United States, the injustice that is happening with police brutality, the justice system, inequalities in pay," according to ESPN. (Nam Y. Huh/AP) Pittsburgh Steelers offensive tackle and former Army Ranger Alejandro Villanueva stands outside the tunnel alone during the national anthem before an NFL football game against the Chicago Bears, Sept. 24, 2017, in Chicago. Even as the protests he inspired become more widepsread, Kaepernick remains unsigned in the NFL. He opted out of his contract with the 49ers after last season.